A draft environment impact statement that came out a few weeks ago on a proposed 40-mile-long coal-car railroad spur in southeastern Montana is at once both enlightened and shockingly ill-informed. It gets the questionable economics of the project right but overlooks the risks such a project would pose to ranchers and the environment. Cattle ranchers have been fighting the condemnation of their land for the proposed Tongue River Railroad for more than three decades, yet the coal industry and its allies in government have tirelessly promoted it. The federal Surface Transportation Board over the years has issued three permits for the railroad, the first in 1986 and the latest in 2007. 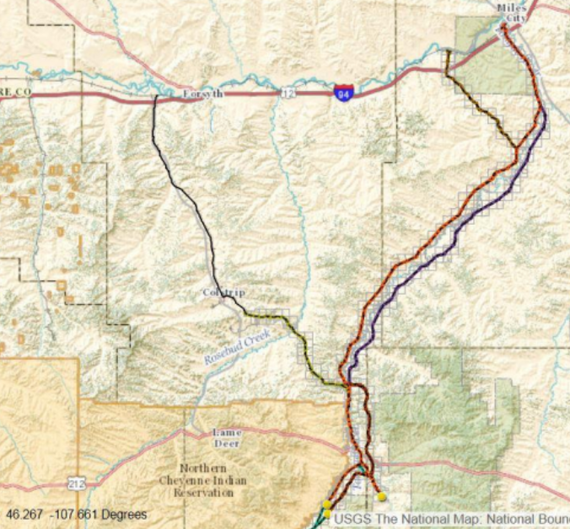 Instead of proceeding with the railroad, however, investors--now including the near-bankrupt Arch Coal, Burlington Northern Santa Fe Railroad, and Forrest Mars, Jr. --keep changing their minds about the route, dragging locals along for the ride. 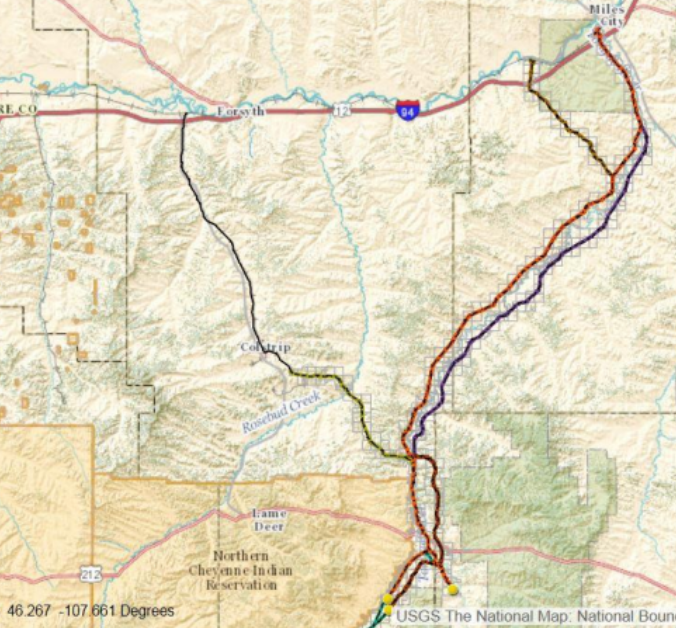 The latest incarnation would put a north-south line near the eastern border of the Northern Cheyenne Reservation in Rosebud County. It would connect with an existing 40-mile spur from the region's main east-west railroad, which parallels Interstate 94. Its ultimate purpose, as proponents tell it, would be as a conduit for coal either to Midwest power plants or to West Coast ports for export to Asia from the proposed Otter Creek Mine. Where the Surface Transportation Board seems to actually understand what's going on is in its emphasis on how little value the railroad would add. - "The total volume of coal trains that would move to ports in the Pacific Northwest from the Powder River Basin would be the same regardless of whether or not the proposed railroad is approved and constructed." - "All exported Tongue River coal would displace other Powder River coal that otherwise would have been exported rather than incrementally adding to the total tonnage of coal exported." - "Tongue River coal, with its lower transportation and production costs, would primarily displace other Powder River Basin coal destined for markets in the Upper Midwest." Further, the Surface Transportation Board, which is part of the U.S. Department of Transportation, sees little reason to believe that condemning and buying land at fair market value, then building and operating a 40-mile-long railroad through rough country would lower the coal industry's transportation costs. From there, the Board's review falls short -- indeed falls apart -- on several critical issues, underestimating and underanalyzing project risks and costs to an alarming degree. - The draft EIS fails to credit, for instance, the "no action alternative" with saving jobs that would be lost at other Powder River Basin mines-- many of which are barely hanging on now--as a result of the project. - The greenhouse-gas section of the analysis includes the extraordinary claim that not building the rail line might somehow increase emissions. - While it concedes that federal pollution-control regulations "could lead to a doubling in coal unit retirements and triple energy efficiency" by 2030, it manages to say nothing about how such a trend would diminish utilization, and return on investment, of such a railroad. - It sees "low risk" from wildfire, although brushfires burned off hundreds of thousands of acres across the landscape in question in 2013. - It includes no detail about bridges or drainage structures along the proposed route, even though the area endured severe flooding in 2011 and 2014 and the applicant's preferred route would run straight through the Tongue River and Rosebud Creek flood plains. - It glosses over the fact that the proposed rail line, which crosses rugged land with high bluffs, would require large amounts of cutting and earthmoving. It also fails to acknowledge that no route map published to date illustrates the dramatic excavation that would be required or the resulting impacts that would require mitigation. - It blindly asserts that the project "would result in minor adverse cumulative impacts on groundwater," even though coal mining on the scale contemplated at Otter Creek has drained aquifers and rendered water supplies unsuited for domestic use elsewhere around the Powder River Basin. - The 4,000-page document includes almost no data on impact to livestock, ignoring evidence that cattle ranchers have brought time and again to federal and state agencies on the detrimental effect a Tongue River Railroad would have on their operations. It is simply stunning, on this point, that any discussion of long-term productivity of the land fails to consider--let alone seriously analyze--the impact on the people most affected by the proposal. Here's to the Surface Transportation Board for seeing that the Tongue River Railroad makes no sense. But shame on the agency for releasing an environmental impact statement with so many oversights and omissions. Disclosure: Carrie La Seur represents landowners threatened with condemnation by the Tongue River Railroad.